Hardcopy available from Amazon.com. There is only one edition of the book. However, there are multiple print runs of the hardcopy, which have fixed various errors (mostly typos). The latest printing is the fourth printing (Sep. 2013). This is what Amazon (at least in the USA) is shipping. Note: page numbering can be different between printings, although the section numbers, figure numbers, and equation numbers are the same. As of 10/19/15, a Korean version of the book is available. Chapter 19 (Undirected graphical models/ Markov random fields). Note: this is from the third printing. This corrects some errors that were found (by Sebastien Bratieres) in sec 19.7. My book has won the 2013 De Groot Prize for best textbook on Statistical Science. 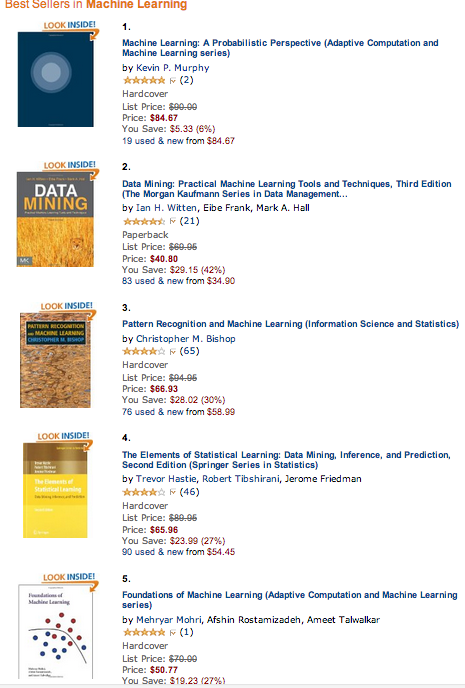 Best selling machine learning book on amazon.com (22 October 2012). 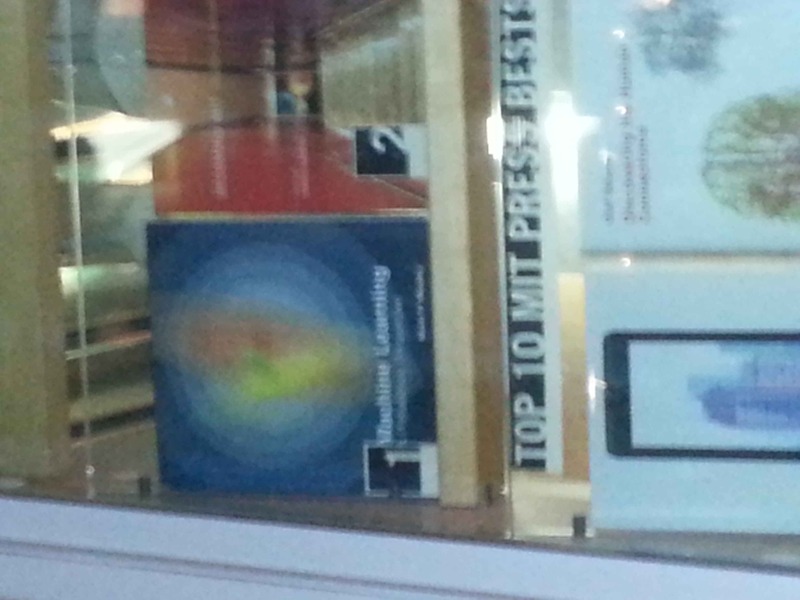 Best selling book at MIT Press (24 November 2012). Resources for instructors from MIT Press. If you are an official instructor, you can request an e-copy, which can help you decide if the book is suitable for your class. You can also request the solutions manual. Slides are not available. "Prof. Murphy excels at unravelling the complexities of machine learning methods while motivating the reader with a stream of illustrated examples and real world case studies. The accompanying software package includes source code for many of the figures, making it both easy and very tempting to dive in and explore these methods for yourself. 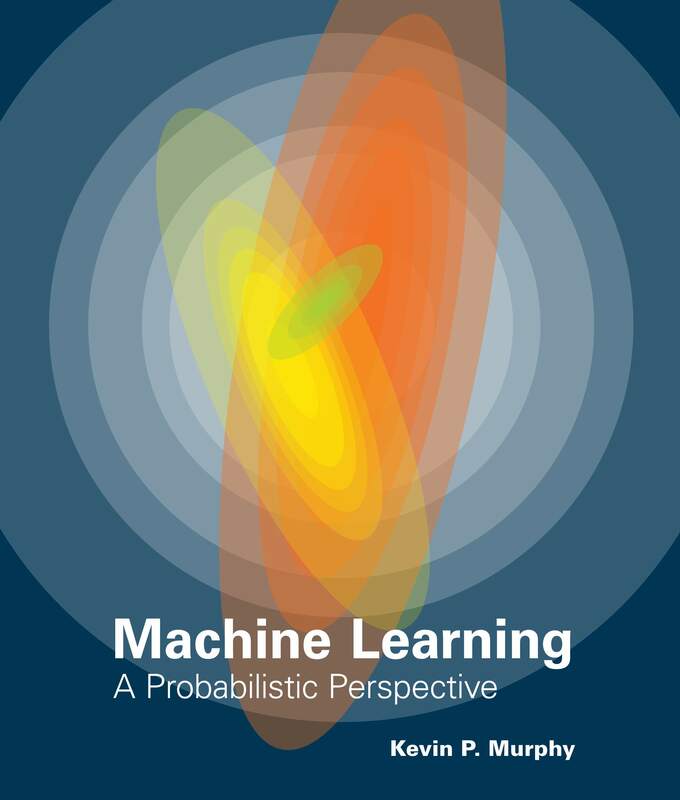 A must-buy for anyone interested in machine learning or curious about how to extract useful knowledge from big data." -- Dr John Winn, Microsoft Research. MLaPP is more accessible to undergrads. It pre-supposes a background in probability, linear algebra, calculus, and programming; however, the mathematical level ramps up slowly, with more difficult sections clearly denoted as such. This makes the book suitable for both undergrads and grads. Summaries of the relevant mathematical background, on topics such as linear algebra, optimization and classical statistics make the book self-contained. MLaPP is more practically-oriented. In particular, it comes with Matlab software to reproduce almost every figure, and to implement almost every algorithm, discussed in the book. It includes many worked examples of the methods applied to real data, with readable source code online. MLaPP covers various important topics that are not discussed in these other books, such as conditional random fields, deep learning, etc. MLaPP is "more Bayesian" than the Hastie or Wasserman books, but "more frequentist" than the Bishop book. In particular, in MLaPP, we make extensive use of MAP estimation, which we regard as "poor man's Bayes". We prefer this to the regularization interpretation of MAP, because then all the methods in the book (except cross validation...) can be viewed as probabilistic inference, or some approximation thereof. The MAP interpretation also allows for an easy "upgrade path" to more accurate methods of approximate Bayesian inference, such as empirical Bayes, variational Bayes, MCMC, SMC, etc. The emphasis is on simple parametric models (linear and logistic regression, discriminant analysis/ naive Bayes, mixture models, factor analysis, graphical models, etc. ), which are the ones most often used in practice. However, we also briefly discuss non-parametric models, such as Gaussian processes, Dirichlet processes, SVMs, RVMs, etc.